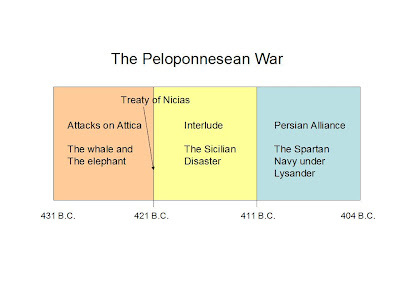 The Peloponnesean War can be broken down into three distinct phases as shown in the following chart. Phase 1 (431-421 B.C.) Because each side had an only single military skill, neither could get the advantage. 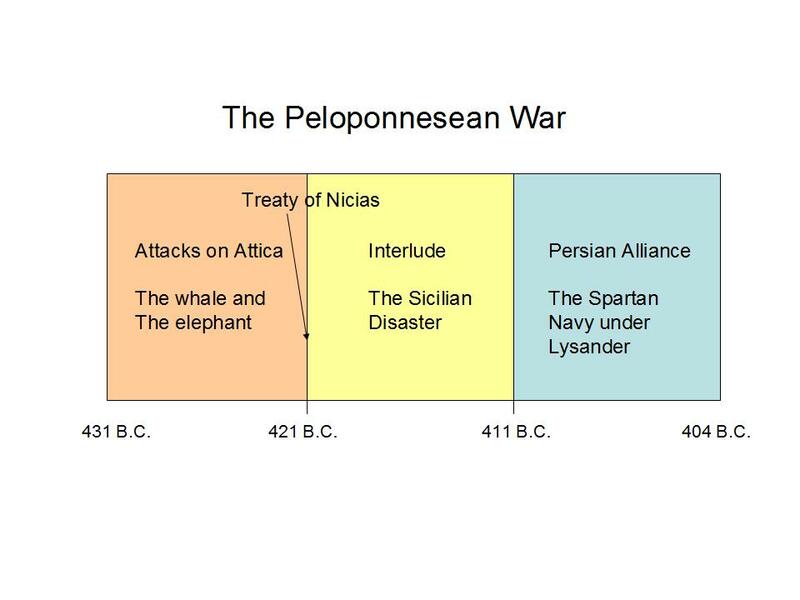 Sparta, the elephant, had an unbeatable army but a weak navy. Athens, the whale, had an unbeatable navy and a weak army. Sparta successfully laid waste to Attica but could not take Athens because of its walls. Athens could defeat Poleis along the coast of the Peloponnese but could not threaten Sparta itself. By 421, both sides were exhausted and the Treaty of Nicias was signed. Phase 2 (421-411) was a ten year interlude in direct attacks, but also the time of the Athenian disaster in Sicily, which was discussed in a previous post. In Phase 3 (411-404), the Spartans made a devil’s bargain with the Persians in exchange for the money they needed to build a navy. The bargain was to allow the Persians to retake the lands in Ionia previously lost to them. This turned out to be the end for the Athenians because the combination of an great army and navy was enough to wear them down to defeat. The Athenians won the first great naval battle in 406 B.C, but the Spartans under Lysander took the Hellespont in 405 with a re-built navy. After wiping out the Athenian fleet, Lysander sailed south to blockade Athens in support of the Spartan land forces under King Agis. The Athenians starved through the winter of 405-404 before they finally surrendered. I have a question, though off topic for this specific posting, related to your to your theme of comparing antiquity and modernity, and particularly to the question of whether the West is progressing or regressing.